It is as simple as this, beer tastes good. And if a new study in Cell Reports by Christiaens and coworkers pans out, you can thank fruit flies for some of those delicious flavors. No, fruit flies aren’t in your beer. Instead, they have forced the evolution of our favorite beast, Saccharomyces cerevisiae, down a path towards making the aromatic compounds that make beer so darned tasty. See, yeast can’t get around on their own and so they often rely on insects to move to new pastures. In order to have this happen, they need to attract insects. Plants have worked this out by evolving colorful flowers and sweet nectar. And one way that yeast may do this is by generating aromas that fruit flies find irresistible. The researchers in this study first stumbled onto this possibility around fifteen years ago. Back then the P.I. was a graduate student who left his yeast flasks out on the bench over the weekend. Over that same weekend fruit flies escaped from a neighboring Drosophila lab and invaded the yeast lab. In a “you got peanut butter on my chocolate” moment, the yeast researchers found the fruit flies swarming around one set of flasks and ignoring some of the others. A quick look at the flasks showed that fruit flies were ignoring the yeast strains in which the ATF1 gene was knocked out. The ATF1 gene encodes the alcohol acetyltransferase responsible for making most of a yeast’s fruity acetate esters. So it makes perfect sense that fruit flies ignored strains deleted for ATF1 because they didn’t smell as good anymore. To confirm this hypothesis, the authors did a fun, controlled experiment. In this experiment, the authors set up a chamber where they could use cameras to track fruit fly movement. One corner of the chamber had the smells from a wild type yeast strain and another corner had smells from that same strain deleted for ATF1. As you can see in the video here, the fruit flies cluster in the corner with the wild type strains. Fruit flies definitely prefer yeast that can make flowery sorts of acetate esters. Christiaens and coworkers took this one step further by actually looking at the effect these chemicals had on Drosophila neurons. 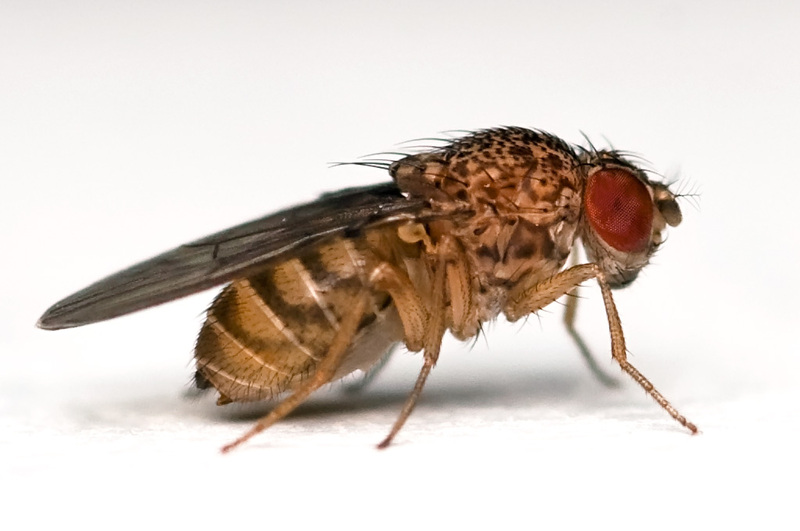 They used a strain of fruit fly containing a marker for neuronal response, so that the researchers could “see” how the flies were reacting to wild type and atf1 mutant yeast smells. As expected from the previous experiments, the olfactory sensory neurons responded differently to each smell. To confirm that the esters were responsible for this difference, the authors observed the effect of adding esters back to media in which the atf1 mutant yeast were growing. They found that as more esters were added, the activity pattern of the Drosophila neurons shifted towards that seen with the wild type yeast. OK, so fruit flies like good smelling yeast. The next question the researchers asked was whether this had any effect on the dispersal of the yeast – and it definitely did. To test this, they labeled wild type and atf1 mutant yeast with two different fluorescent markers, so the strains could be distinguished from each other. They then spotted each strain opposite from one another on a specially designed yeast plate and let a fruit fly roam the plate. They then removed the fly and the original spots of the yeast cells. After letting the plate incubate for 48 hours, so that any yeast cells that had been moved around on the plate could grow up into colonies, they washed the plate to remove the cells that had been dispersed by the fly and used flow cytometry to determine the amount of each strain. They found that wild type yeast were transported about four times more often than the aft1 mutant yeast. These results show that fruit flies are more likely to disperse yeast if the yeast are producing fruity smells. Given the close relationship between fruit flies and yeast, and the fact that insect vectors are very important for yeast out in the wild, it is reasonable to think that yeast may smell good in order to attract fruit flies to carry them to new places. This research also again points to the importance of expanding studies to include more than one organism (see our last blog here). By increasing the diversity of organisms in an experiment, we can learn much more about how things work in the real world. And maybe even learn why yeast evolved to give us such delicious beer.